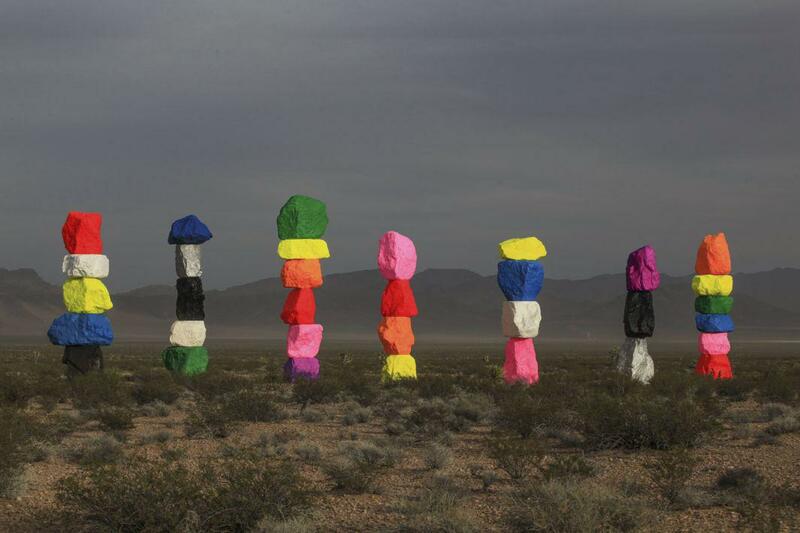 Seven Magic Mountains by Ugo Rondinone is an acid trip of an art installation in the Las Vegas desert. Why Did This Artist Build Giant, Technicolor “Magic Mountains” in the Desert? 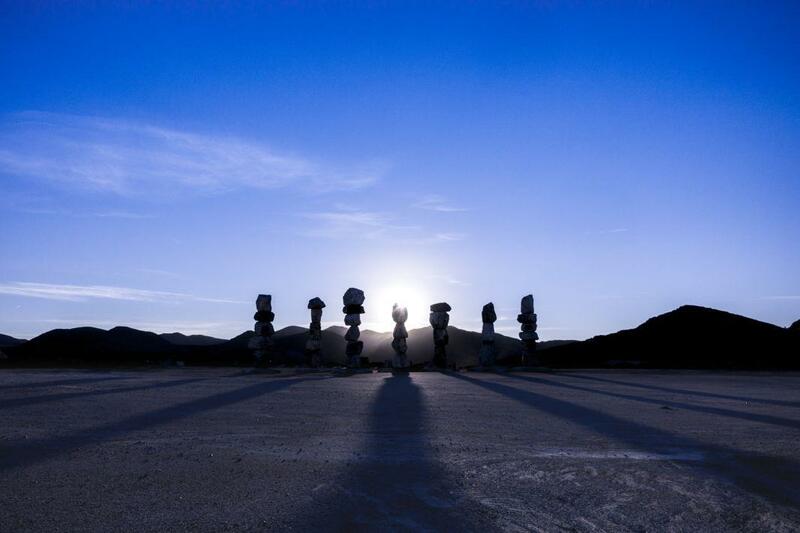 Artist Ugo Rondinone’s Seven Magic Mountains, Las Vegas, 2016. 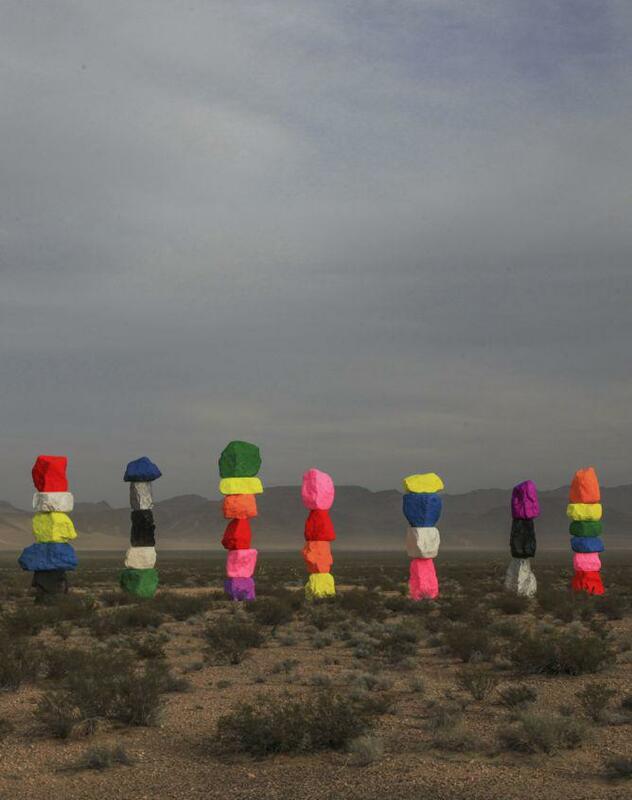 About 10 miles south of Las Vegas, near Jean Dry Lake and Interstate 15, seven technicolor limestone totem poles rise in the arid, sun-faded desert landscape like a shockingly pigmented mirage. 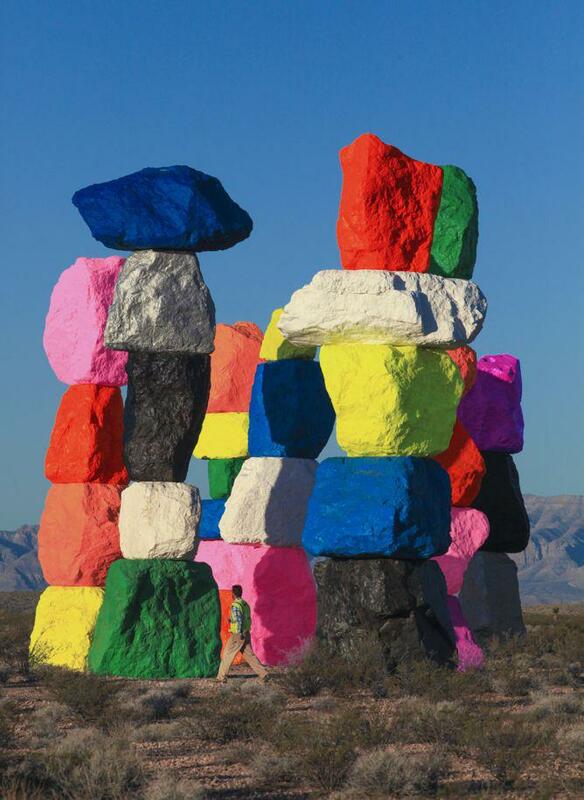 The fluorescent acid trip of an art installation is Seven Magic Mountains, the work of Swiss-born, New York–based artist Ugo Rondinone. 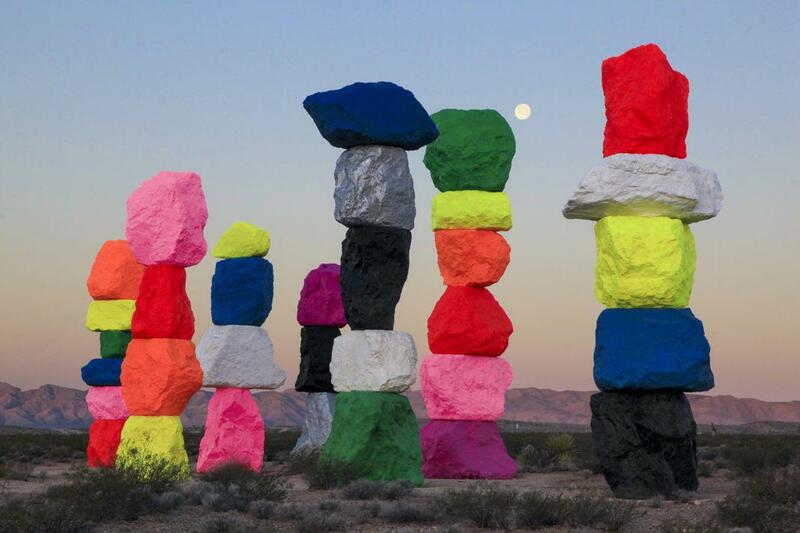 Commissioned by the Art Production Fund and the Nevada Museum of Art, Seven Magic Mountains looks spontaneous, as if a band of artists might have assembled it under the cover of night on a lark. 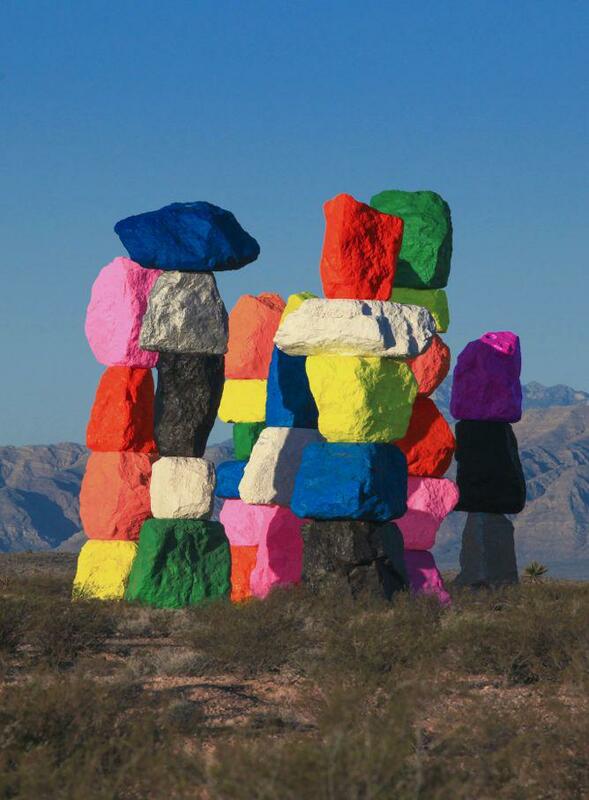 But it took Rondinone five years to complete the gravity-defying work, in which locally sourced painted limestone boulders are stacked into totems that each stand between 30 and 35 feet high. The New York Times noted that the piece is part of a decadeslong tradition of large-scale land art in the area and one of the largest land-art pieces created in the U.S. in the past 40 years. Note the human, to demonstrate scale. And while time and the elements certainly will have their way with the work, the organizers say that any man-made damage will be repaired (even though the boulders had been precoated with clear anti-graffiti paint, the installation has already been tagged once since opening May 11). A representative for the museum told me in an email that the graffiti was removed within 36 hours and that they are working with local authorities to devise a plan for increased patrol.